The recent study by Miranda & Fontanelle (2015) is a welcome addition to our knowledge of Megalobulimus species. ABSTRACT. The population dynamics of Megalobulimus paranaguensis (Pilsbry & Ihering, 1900), a large and long-lived land gastropod from Brazil’s Southeast (Atlantic Forest) was studied between 2006 and 2009, at an urban park in the city of Santos, state of São Paulo. The study included biometry, weighing, and marking and recapture of adult individu- als. The variables obtained from specimens were correlated with the environmental variables of the study period. The survival rate of the adult snail population was 96.7%. Recruitment showed several peaks during the year, and was concentrated between April and August, except in 2009, when there was only one peak in August. Specimen abun- dance progressively increased from 2006 on, with a trend towards relative stability during that period. The condition factor remained relatively stable as well, decreasing from December to February. 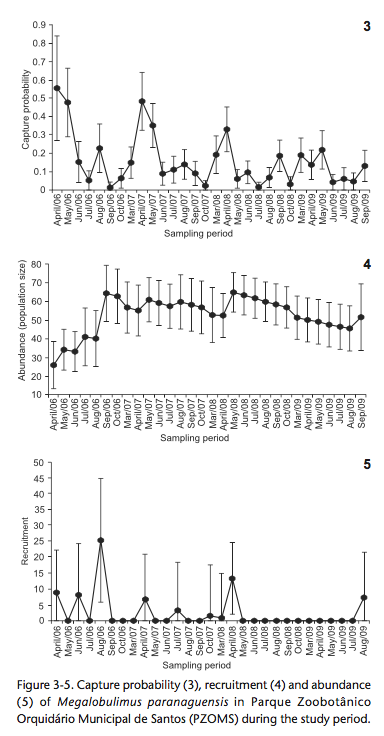 The potential evapotranspiration and precipitation influenced the number of captures, and the mean temperature influenced the condition factor. Megalobulimus paranaguensis goes through a period of dormancy in the tropical summer, which is between November and February, but remains active in the winter. The survival rate of M. paranaguensis was high, and may be the result of having its annual cycle synchronized with the tropical climate of the Atlantic forest. Miranda, M.S. & Fontenelle, J.H., 2015. Population dynamics of Megalobulimus paranaguensis (Gastropoda: Pulmonata) in the southeast coast of Brazil. – Zoologia 32 (6): 463–468. This entry was posted in Uncategorized and tagged biology, brazil, literature, Megalobulimidae on March 31, 2016 by bramb.